Researchers led by Professor Stefan Pfister from the “Hopp Children’s Cancer Center at the NCT Heidelberg” (KiTZ) have been able to draw an extremely detailed molecular map of childhood cancers. In close collaboration with the German Cancer Consortium (DKTK) and the Society for Pediatric Oncology and Hematology (GPOH), they screened almost 1,000 tumor samples from 24 cancer types for genetic alterations and then classified these alterations. In 50 percent of the samples, they found targets for novel anticancer drugs, thus opening up new therapy approaches. The findings have now been published in Nature. The “Hopp Children’s Cancer Center at the NCT Heidelberg” (KiTZ) is a joint initiative of Heidelberg University Hospital and the German Cancer Research Center (DKFZ). Up to now, comprehensive molecular-genetic data analyses in pediatric oncology have been rare because patient numbers are comparatively small. However, they would be urgently needed in order to further improve the survival rates of children suffering from cancer. About 20 percent of the young patients still die from the disease. In addition, findings concerning cancer in adults cannot be translated readily to children and adolescents. Heidelberg scientists from the KiTZ, in collaboration with colleagues from the DKFZ, DKTK, NCT and Heidelberg University Hospital as well as specialized research teams from the Society for Pediatric Oncology and Hematology (GPOH), have studied the genetic repertoire of childhood cancer. With the goal of identifying novel approaches for diagnosis and treatment of cancer in children, the investigators used the most advanced DNA sequencing technology and comprehensive data analysis to take a very close look at point mutations in DNA as well as larger structural changes in 961 tumors of 24 different types of cancer. In approximately seven percent of all cases, the scientists found genomic alterations that are suspected to have played a role in the development of cancer in these patients. These so-called germline mutations can either be inherited from a parent or form at the very beginning of embryonic development and, therefore, are present in every single body cell of a patient. They are transmitted to the next generation of offspring. Patients with heritable forms of cancer need special attention, because they often need to be treated differently from patients with the same type of cancer who do not have a heritable predisposition. The project has received major support from the German Cancer Consortium (DKTK), the German Cancer Aid (Deutsche Krebshilfe) and the German Childhood Cancer Foundation (Deutsche Kinderkrebsstiftung). The „Hopp Children’s Cancer Center at the NCT Heidelberg” (KiTZ) is a joint institution of the Heidelberg University Hospital and the German Cancer Research Center (DKFZ). 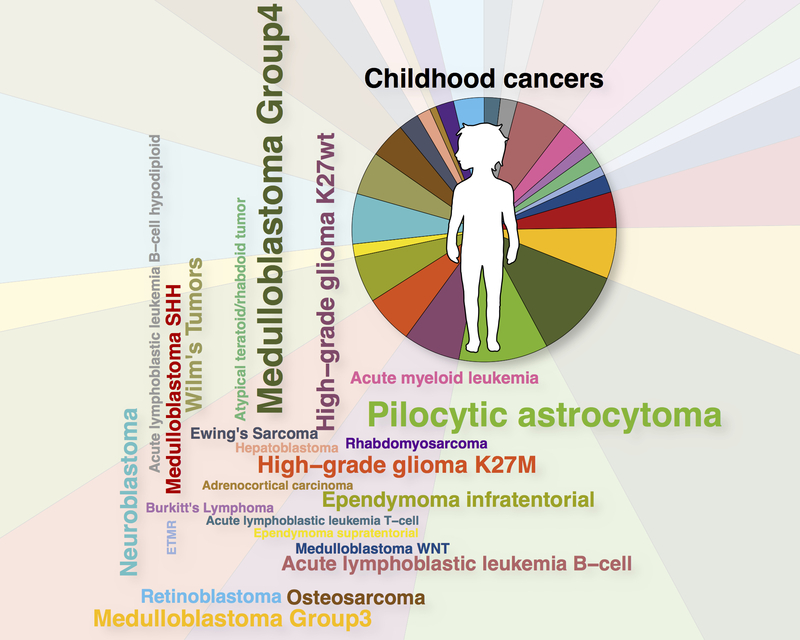 As a therapy and research center for oncologic and hematologic diseases in children and adolescents, the KiTZ is committed to scientifically exploring the biology of childhood cancer and to closely linking promising research approaches with patient care– from diagnosis to treatment and aftercare. Children suffering from cancer, especially those with no established therapy options, are given an individual therapy plan in the KiTZ, which is created by interdisciplinary expert groups in so-called tumor boards. Many young patients can participate in clinical trials which ensures access to new therapy options. Thus, the KiTZ is a pioneering institution for transferring research knowledge from the laboratory to the clinic.